You can set your status as an agent to either Online, Away or Invisible Status. To change your status go to the Top Right of the tawk.to Dashboard and use the drop down menu. Online Status – You are online and available to answer incoming chats. 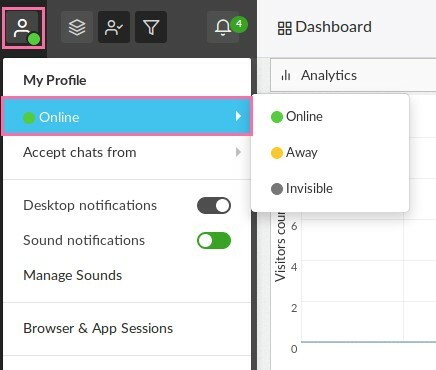 Away Status – You are online and available to answer chats but have set the widget message to say “Away” to set the visitors expectation that you may or may not be available to answer their chat. Invisible Status – You are offline. You are however able to see chats in the tawk.to dashboard but you can not join them. This status should only be used to monitor chats. NOTE: You must have at least 1 agent logged into the dashboard that is not set to invisible status for the widget to indicate that you are online.